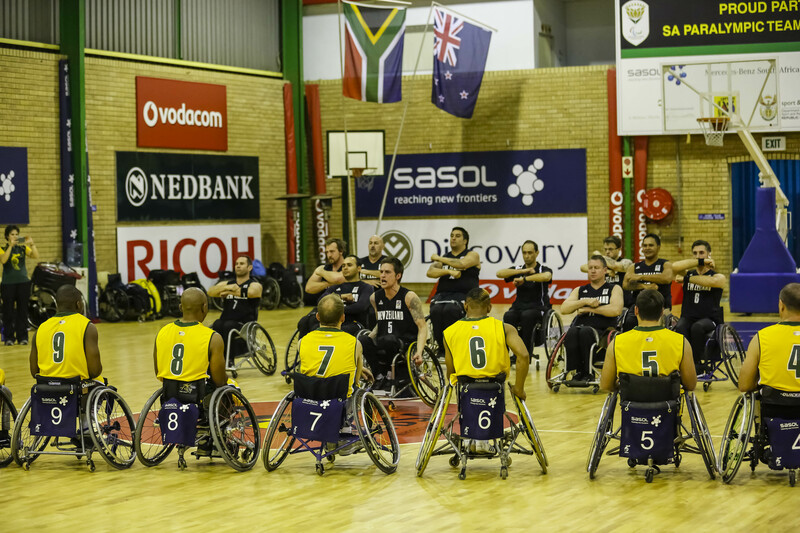 The Sasol South African men’s wheelchair basketball team produced a polished display to beat the New Zealand Roller Blacks by an astounding 95-35 scoreline at Mandeville Sports Centre, Bezuidenhout Valley, Johannesburg on Friday. The New Zealanders thrilled the crowd with their performance of the renowned Haka war cry prior to the start of the match, with Gift Mooketsi leading the Sasol Amawheelaboys response of ‘Niya ba Saba na? Haii asiba sabe Siyabafuna’ (Are you scared of them? No we are not afraid but we want them). When the buzzer went for game time it was the Sasol Amawheelaboys who dominated all phases of play, in taking a 22-9 lead after the first quarter, and a 49-21 advantage at halftime. The South Africans were ahead 72-33 at three quarter time. The hosts were too strong on the attack with three-time Paralympian Richard Nortje displaying too much speed and strength for the New Zealand defence to handle in his 20 minutes of on court game time. Further Sasol All Star Series internationals between the two teams will take place on Saturday and Sunday afternoon.